Dimensions 0.14 by 5.08 by 7.80 in. Amazon.com description: Product Description: The Common Core State Standards require all students to think in complex and creative ways and apply classroom learning in new contexts. Yet many teachers already struggle with reaching all learners, who come to school with varied levels of readiness, interests, and learning profiles. What to do now that the expectations are even higher? 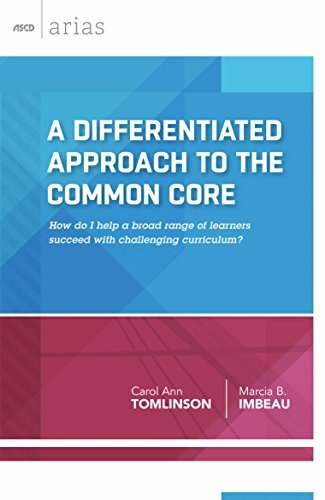 Differentiated instruction experts Carol Ann Tomlinson and Marcia B. Imbeau offer practical, thoughtful advice on how to plan, deliver, and assess instruction that meets this new level of challenge. Combining the goals of the Common Core with the principles of differentiation, the authors present an eight-step process to help teachers make rich, intellectually rigorous curriculum accessible to a very broad range of students. With examples across grade levels and content areas and a checklist for reflection on the eight steps, this timely publication will show you how to meet high expectations with responsive instruction and help all your students grow as thinkers and problem solvers.